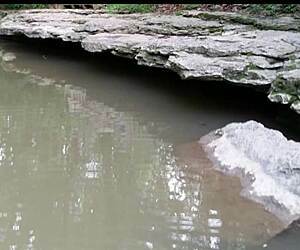 Looking for the best Fishing trails around Blue Springs? Find the top rated fishing trails in Blue Springs, whether you're looking for an easy short fishing trail or a long fishing trail, you'll find what you're looking for. Click on a fishing trail below to find trail descriptions, trail maps, photos, and reviews. As of summer 2018 the Riverfront Trail is open it's full length from the western trailhead at 9 Highway to the eastern one in EH Young Riverfront park. I ride it regularly, find it to be in excellent shape and quite peaceful. Starting at the western trailhead the trail is asphalt as it winds through quiet woods in the bottomland next to the Missouri River. 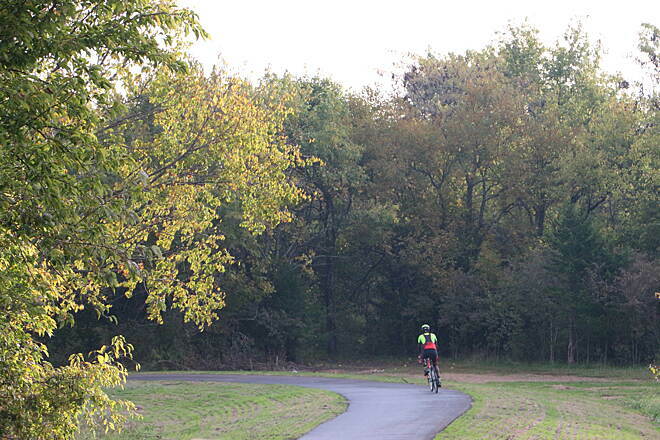 As you continue, the trail climbs up to the Quindaro Bend Levee where it becomes pea gravel. 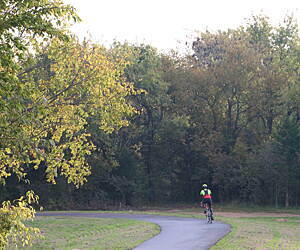 The trail travels under Interstate 635 and 169 Highway before dropping down from the levee adjacent to Argosy Casino. From here, the trail becomes concrete and parallels the roads. Traffic into the casino can be heavy at times, so be mindful at road crossings. The trail finally ends just past the casino at EH Young Riverfront Park. Directly across the casino you can also access the Line Creek Trail, which will lead you into downtown Riverside and provide access all the way up to Barry Road, as well as the Briarcliff Linear Trail. Eventually the Missouri Riverfront Trail is supposed to connect to English Landing Park in downtown Parkville. A concrete path has been poured leading to the park and is rideable, but it's exit (only 50 yards or so shy of English Landing) is currently gated off. I suspect this is due to a railroad right-of-way issue, as the path would need to be perilously close to the busy railroad tracks. Hopefully this connection is finished soon, as it would provide a car-free commuting route between Parkville and Riverside. I bike the Trolley Track Trail to get from the Country Club Plaza to Waldo frequently. The trail surface is similar to most rail-trails, and it can get quite crowded with walkers and joggers on nice evenings. There are also numerous road crossings, so it's difficult to keep up a decent pace. If you're in a hurry you're better off riding adjacent Brookside Boulevard. Overall this is a decent trail for commuting and leisurely weekend rides, but too short, with too many road crossings to make it any sort of destination. Nice relaxing ride when it’s dry. 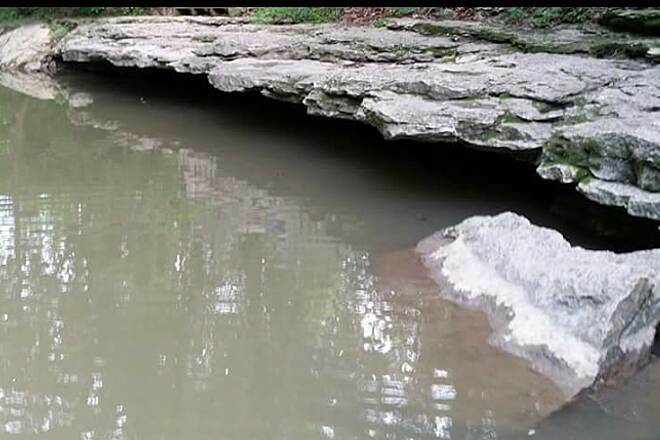 Often sections will be closed after heavy rains for trail repair/ maintenance. Now about 8 miles long, but construction continues. From the west end where the shopping center is, you can cross over I-29 on Old Tiffany SpringsRoad (narrow bridge but not much traffic.) Cross over to the old hotel they’re working on. From there take the walkway through apartment comple, then you’ll come to the new trail. Not officially open, but passable to Amity Road. Beautiful winding trail around a lake. Hardly any steep hills, great for me, recovering from heart surgery. I love coming here. We used the trail as Bikers. Trail appears to have been built in the 70's. While there are some newer sections - most is very narrow with many cracks and pavement buckles. Don't take a road bike. Need a gravel bike or mountain bike to help with the constant jarring. Many intersections thought out poorly. Bridge crossing outside of large park strange at best - its a two way stretch over the bridge that's barely wide enough for one bike let alone two going opposite directions. You have the bridge wall and these cement partitions so I guess creativity would be required when two bikers are crossing in opposite directions. There are also a few unusually steep grades for a trail which I like but I question if the trail is wide enough for cyclists to pass each other going the opposite directions. An accident waiting to happen. We may have just been lucky the day we rode it but we came across the rudest group of runners we ever came across on a trail. (45 years of cycling) We are always polite on a trail - we announce our presence and also ring a bell softly letting them know we will be passing them on the left. They refused to let us pass. Was able to find road option to jump ahead of them. If you are looking for a paved trail to ride I would head out to Lawrence. I rode this trail at the end of September 2018 for the first time in years. The section I rode - between Barker Rd & 87th - was in good shape, the people I encountered were friendly and there are several scenic creek crossings. If you're in the area and have time, definitely check out this trail! This is such a beautiful trail. Look out for the "tour de france" trainers. There is no yielding to pedestrians, those pushing strollers, walking toddlers. This is a strictly fast bicycle trail. It has been so for a few years. I recommend separate hours for bicycles and for pedestrians before there is an accident. Good trail for walking with or without your dog,running,biking and family friendly.There’s also another trail across the street that runs all the way to Barry Road.Great place ,just wish people are more conscientious at picking up after their dogs. We rode the entire trail today (7/07/18) from Pleasant Hill to Windsor and we couldn't have been more impressed. Not only has the Department of Conservation done a great job of improving the trail condition of the East end of the trail the 2 new depots at Chilhowee & Leeton are very nice. Also the addition of a place to sit out of the sun at the Medford trailhead is awesome! This trail Gas a great mixture of crop land and woods, it's quite rural and we saw several deer early in the morning. Just rode the whole trail at the end of June 2018. The trail surface was in terrific condition. Smooth as a baby’s bottom. It seems to be lightly travelled unfortunately. Bring plenty of water. Services in town are somewhat spotty- there’s only one little convenience store in Chilhowie for example. Wear sunscreen too- I’d say it’s only 2/3 shaded. 1st time user. Started at Argosy, and went north to the 1st park, then there were no signs or sidewalk marks when the trail gets to the street saying where to pick it up again. I got lost and wasted 30 minutes looking for the trail continuation. This happens every time the trail dumps you at a street. I even had someone at the upper end of the trail ask how to get to the river, and they had the same concern about lack of signage or markings. On the good side, this is a beautiful, well maintained trail - and I very much enjoyed the ride.